This project is developed in the field of mobile robot cooperation. The goal is make an application that can perform a cleaning or inspection mission through cooperation of several robots. The team is composed of four types of robots: Morlaco (Mobile RobotLaser Controlled) built by the Robotics Group at the University of Salamanca and commercial robots Roomba 416, Roomba 560 and AmigoBot. We have used MissionLab for the development of this project. This architecture provides a rich set of software tools for developing and testing the behavior of a robot or a group of mobile robots. These behaviors can be performed in simulation and on real robots. This project we have integrated Roomba and Morlaco robots into MissionLab, Amigobot was already integrated. We propose a cooperation in which the leader guides the slave robots along a corridor and, when it finds an open door, sends a slave robot to inspect or vacuum inside the room. 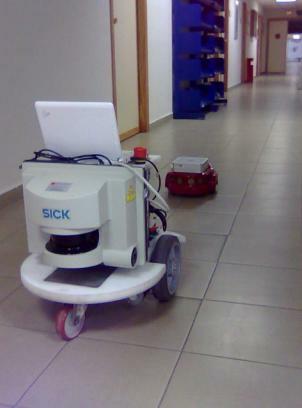 After cleaning or inspection, the slave robot leaves the room and follows again the leader robot.